Jeremy Youde reports in his article ‘Mitigating Risk’ that after decades of a rigid inefficient disease surveillance system, the WHO made some feeble steps in 1995 to revise and update the IHR. However, it is really the 2003 SARS epidemic that forced states to wake up to the urgency of the revisions. Then the WHO was only empowered to work on cholera, yellow fever and plague (small pox, typhus and relapsing fever were removed from the original list over the 70s and 80s). But WHO response to SARS, despite a legal vacuum, was widely celebrated and installed WHO as the undisputed ally in international public emergencies. IHR 2005 also allows WHO to receive information on public health events of international concern from non-state actors, including news reports and internet sources, request further information from the state involved without disclosing its sources and the state is obliged to comply. This move away from the state-centric view of previous versions of IHR, clearly borrowed from human rights law practice, signals further the clear recognition of international law that substantive concerns must override narrow state perceptions of sovereignty. The IHR is a law of maximums. It delineates the most severe restrictions to individual freedoms, trade and traffic allowable. States cannot legally exceed its dictates. This is important in understanding IHR’s response to human rights. While earlier IHR versions were silent on human rights, IHR 2005 in Article 3 affirms ‘The implementation of these regulations shall be with the full respect for the dignity, human rights, and fundamental freedoms of persons’. Not forgetting state rights, it also provides for respect for the Charter of the United Nations and the WHO Constitution. Human rights principles requiring the least intrusive means of limiting a human rights are reaffirmed in IHR 2005 (Articles 31 and 43). Informed consent and confidentiality of medical records are preserved. But how exactly does a public health emergency of international concern affect African states’ obligations to the African Charter on Human and Peoples’ Rights that allows no derogations but provides for limitations (Article 27)? Are African states with more severe rights curtailing national legal regimes allowed to transgress the African Charter using the IHR 2005? Are African states permitted to limit freedom of information for next of kin, right to food, right to health for the millions of people not affected by Ebola and right to make a decent living for the thousands of quarantined persons? What of refugee rights on the basis of “events seriously disturbing public order”? Are there obligations of solidarity on African states? Does an inter-state obligation to apply IHR 2005 mandated restrictions in negotiated good faith arise in the human rights framework of the African Charter and the AU Constitutive Act? Such a case has not been presented to an African human rights court. For the most part, it can be expected that were such a case to be submitted, such a court would be sympathetic to state discretion. Probably what truly suffers in the prevailing legal lacuna is the very rule of law itself. There is need for reasoned direction for African states on the nature of their obligations to the African Charter. Affirming the nature of their lawful political discretion can only strengthen the rule of law. It would also inform the probable human rights cases that may arise from this outbreak. Considering the loud lament of the worst affected countries, even inter-state cases cannot be ruled out. The 56th African Commission Ordinary Session slated for Niamey in October 2014 was postponed sine die without even an official statement from the Commission. To be clear, the Ebola outbreak presents very cogent reasons for such a decision, but universally accepted norms of administrative justice demand that the Commission at the very least, issues an official statement delineating its reasoned decision to postpone the session. On 21 October 2014, however, the African Commission announced the 56th session will be held 1-17 December in Banjul, The Gambia. Also important are the implications for another matter that has quietly haunted African Commission sessions. States hosting the Commission sessions are bound by the human rights implications of the AU diplomatic immunities framework that the Commission enjoys. How do these apply in a time of Ebola? The rule of law and legitimacy of African institutions suffers with opaque decision making. The AU Commission itself ought to consider this question for the entirety of AU organs. And let us not forget that the stature of the UN did not suffer but rather was strengthened by the Reparations case and Immunities of UN Special Rapporteurs case before the ICJ. Since the African Court cannot initiate its own proceedings, it would be most fitting for the African Commission, that is granted such competence, to in the spirit of complementarity with the African Court and the ideals of the AU Human Rights Strategy, seek an advisory opinion of the Court. The Commission need not shoulder this burden alone. It can and should launch a public call for amicus curiae submissions from AU states and civil society to help enlighten the breadth and scope of the matters to be determined, including submissions on the trade and travel obligations under AU law. If ever there were an issue that strikes at the heart of the debate on the place of the human person in public international law, and the capacity of human rights law to balance competing yet equally compelling issues, it is the 2014 Ebola outbreak. If ever there were a time for the African Commission and African Court to cement their pride of place on the construction of the rule of law in Africa, this is it. There are legitimate fears, irrational ones too, but there is also the rule of law and the competent authorities. As things stand however, Guineans, Sierra Leoneans and Liberians are still waiting for love in a time of Ebola, to borrow from Gabriel Garcia Marquez’ Love in a Time of Cholera. Only this time, they may not live to rediscover the intoxicating love of their youth in old age as did Marquez’ characters. Ebola kills human beings and communities much faster. 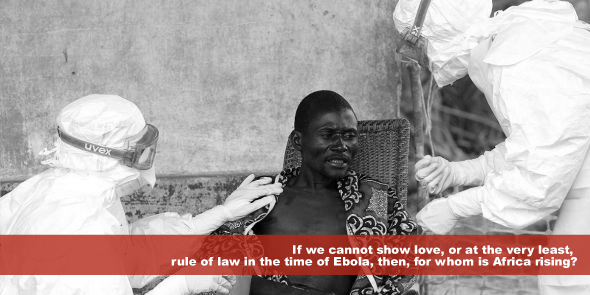 If we cannot show love, or at the very least, rule of law in the time of Ebola, then, for whom is Africa rising? Humphrey Sipalla is a freelance editor, researching on pop culture and international law and currently enjoying the exercise of his ICCPR Art.23.2 rights in Nairobi. Reblogged this on eensamegenugtig's Blog.